The Cafe or Coffee Shop is the ideal location to relax, have a meal or drink and socialise. 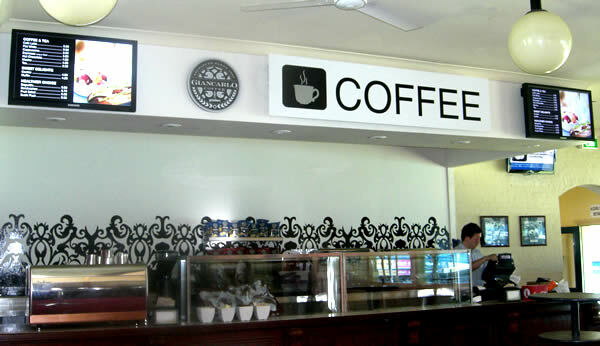 Digital Signage is turning the LCD into an entertainment and information piece for your Cafe, providing your customers with news, weather and TV along with your own promotions and menus. Digital Signage was made for Cafes. Imagine an LCD displaying either a Breakfast Menu, a Lunch Menu, Afternoon Tea or even a Dinner Menu, all perfectly formatted and displayed with a steaming Cappacino in the background with the menus changing automatically based on your own schedule. Digital Menus can be displayed on a full screen or zoned with a combination of TV and your own media files. Command offers a range of solutions from Cafe TV, Promotion Displays, Digital Menu Boards and Advertising screens, all suitable for a new customer experience. • Remote Management, Multiple Display Zones, Scrolling Ticker.